Television Drama, Society, and the Production of Meaning in Reform-era China . Honolulu: University of Hawaii Press, 2010. 219 pp. It is undeniable that television has become a pervasive part of contemporary life. In China, the last three decades have seen dramatic growth in the industry, including macro policy changes, technology advancements, the entry of foreign television networks, and radically diversified program offerings. These developments owe as much to the rise of powerful provincial channels as to the increasing number of co-productions from Greater China. The processes of commercialization and globalization that underlie and are in turn influenced by these changes demand that television be given a more central place in discussions of contemporary Chinese culture, next to both literature and film, as author Zhong Xueping argues in her introduction to Mainstream Culture Refocused. Indeed, television as a social medium is expanding its public roles and influence. The diversity of Chinese television output now offers a variety of perspectives on matters of public concern. The same issue, for example, can find expressions in talk shows, serial dramas, reality television, game shows, and even commercials. In Mainstream Culture Refocused, Zhong chooses to focus on television drama, arguably the most popular form of TV programming, and, as the author establishes early in her book, the dominant mode of storytelling in contemporary China. Perhaps more so than ever, television today has become the place to tell a Chinese story, as the medium morphs into an integral part of the nation’s collective consciousness, its shared narrative[s] of experience and identity. Whether as a communication channel, a cultural and educational institution, or as an entertainment system, television has provoked much dialogue and enthusiasm among the Chinese population. But not until recently has Chinese television been recognized as having attained and accrued a sufficient degree of complexity to warrant English-language book-length studies. Zhong’s monograph, delineating the rising arc of the medium since the 1980s, adds to the growing literature that aims at identifying and measuring the impact of television on China. In strictly academic prose, and with a keen eye for detail, Zhong provides facts and information, while situating her theoretical discourse and textual analyses against the backdrop of China’s political economy and social changes.Mainstream Culture Refocused also demands special attention for being the first work to stress the progression of historical thinking in this fledgling field of Chinese television studies, and, drawing from several major cultural legacies, it considers a series of questions that are fundamental to the understanding of television in post-socialist China. Furthermore, Zhong’s approach diverges from the dichotomized state-market framework that, as she observes, is often assumed to be self-explanatory in the discussion of Chinese mainstream culture (p. 10). Instead, the bulk of Zhong’s analysis draws attention to the cultural-political contexts which are grounded in the nation’s century-long pursuit of modernity, and which explain the controversies and intellectual anxieties underneath China’s state-regulated, profit-driven model of television consumption today. With the exception of the Introduction, which has a pronounced goal of calling academic attention to the oft-overlooked arena of “mainstream culture,” and which lays out Zhong’s theoretical model and terminology, the numbered chapters of Mainstream Culture Refocused explore the problematic of television subgenres and illustrate the textual and contextual relevance of individual dramas. Chapter 1, which is a deliberate digression from the book’s otherwise genre-specific chapter breakdown, studies the television motif in three films: Ermo (Zhou Xiaowen, 1994), Unknown Pleasures (Jia Zhangke, 2002), and Still Life (Jia Zhangke, 2006). Zhong’s analysis elaborates on the idea that television’s presence in these films positions the characters and their practices of viewership within a particular historical context and larger societal issues, inferring that television is “an embodiment of tensions and contradictions in the changing social and economic relations” (p. 34). Television is instrumental in exposing the gap between the individual’s actual socio-economic reality and his or her conception and imagination of that reality. The assumption that a character’s identity and destiny are subsumed by his or her position in the stratified social structure, and that television is now an integral part of this dynamic, is at the heart of Zhong’s analysis, and serves as a theoretical premise throughout the book. In Chapters 2 to 5, Zhong singles out four kinds of television subgenres that have enjoyed vast popularity in the post-1980 era—emperor dramas, anti-corruption dramas, youth dramas, and family-marriage dramas—and respectively subjects them to scholarly scrutiny. Each chapter provides original analyses of several television texts. Zhong’s nuanced readings often start with story outlines, before progressing into dialectical examinations of the dramatic characters—their purposes, flaws, beliefs, and often downfalls—vis-à-vis the larger, presiding social mechanisms and ideology at play. Chapter 2 examines the characteristics of the ubiquitous emperor dramas and the intellectual ambiguity behind their popularity. The subgenre is further divided into two styles, the “playfully told” (戏说) and the “seriously told” (正说). Zhong observes that the former–such as Princess Huanzhu 还珠格格, Emperor Kangxi Traveling Undercover 康熙微服私访记–bank on the contemporary notion of “cool,” making emperors into affable and even goofy individuals capable of modern irony and feelings; whereas the latter —such as Yongzheng Court 雍正王朝, Emperor Wu of the Han Dynasty 汉武大帝—often “reinstate” previously ill-reputed emperors by portraying them as tragically-fated dynastic heroes. Zhong suggests that these emperor dramas contribute to a new canon of heroic paragons in an age when early revolutionary idols have lost their appeal with the contemporary audience. Citing Wang Ban’s line from Illuminations from the Past that “the notion of history is bound up with modernity” (p. 67), Zhong argues that both the ahistorical playfulness, which deconstructs modern China’s trauma-oriented sense of history (pp. 56-7), and the serious refashioning of historical figures, are indicative of the depoliticized ideological nature of contemporary mainstream culture and its uncertainty toward China’s own historical agency. Chapter 3 offers close readings of four anti-corruption dramas: Sued by the State 国家公诉, Red Carnations 红色康乃馨, Black Hole 黑洞, and The Police Chief 公安局長. All were released between 1995 and 2005, a decade when “anti[-]corruption drama became a mainstay in programming on television channels at all levels.” (p. 73). In this chapter, Zhong asks fundamental questions about the “polyphonic” portrayal of (anti-) corruption activities, by which she means “an array of perspectives and ideological positions that inform their specific representations” (p. 95). She also addresses the problematic vehicle of “law,” and the various socio-ideological issues underpinning the “formulaic” narrative style of anti-corruption drama (p.74). While acknowledging the enlightening potential and politically charged nature of these dramas (“[a]nticorruption dramas inevitably serve as a constant reminder of the darker side of society or…a major venue for expressing social discontent and criticism disguised as entertainment.” p.75), Zhong remains aware that they tend to deflect social justice issues, by defaulting to a redemptive narrative structure that features morally upright protagonists and typical feel-good endings. Zhong contends that, by making a moral figure—often a legal professional such as a district attorney, a lawyer, or a policeman— the fighter of the anti-corruption battle, and by addressing corruption mainly at a legal level, the narrative fails to pinpoint the real issue at stake, i.e., the widening inequality between average Chinese and those in power, as well as the hardship and exploitation inflicted upon people in a corrupt society. In Chapter 4, Zhong shifts focus to youth drama, a category facing high barriers to success in a domestic market that has been saturated with imported “youth-idol dramas” 青春偶像剧 since the 1990s. Zhong intimates that competition from these foreign imports forced Chinese youth dramas to be both innovative and “believable” (i.e., as accurately depicting the lives of domestic youth, to avoid being taken as simple knock-offs of the foreign imports; p. 101). To look at the subgenre contextually, Zhong traces the etymology of the word “youth” back to the early twentieth century, contrasting its then-revolutionary associations with a contemporary undertone that is saturated with consumerism and capitalism. Zhong subsequently explores three types of youth dramas that speak to different types and historical manifestations of “youth.” The first type are those based on Hai Yan’s fiction and whose storyline involves placing young and beautiful protagonists—often part of the floating population from small-town China—in harsh urban settings, where they eventually meet with “rapid social changes, economic uncertainties, and sometimes violent consequences” (p.106). Titles include: Eyes Forever Open 永不瞑目, Jade Goddess of Mercy 玉观音, With What to Save You, My Loved One 拿什么拯救你，我的爱人, and Ordinary Life 平淡生活. The second type are the “post-youth” dramas that chronicle the generation whose youth straddles the Mao and post-Mao eras, for example Romantic Life in Brilliant Red 血色浪漫, and Age of True Feelings 真情年代. Zhong’s third type are the “counter-idol” youth dramas, such as Soldiers, Be Ready 士兵突击, which celebrate an alternative, anti-heroic type of young hero. Zhong suggests that the images of youth represented in these dramas extend beyond the scope of familiar popular romances and are symptomatic of the ideological uncertainties of contemporary Chinese society and its collective search for idealism and direction. In Chapter 5, Zhong investigates the socio-political implications of what appears to be a prejudiced perspective on female identity in family-marriage dramas. Zhong focuses on the pervasive discourse on happiness in television series adapted from three women writers’ works: Chi Li’s Comings and Goings 來來往往, Wang Hailing’s Divorce Chinese Style 中国式离婚, and Wan Fang’s Empty House 空房子 and Nothing in the Mirror 空镜子. Comparing the female characters in these dramas to those in Chinese women’s literature in the early 1980s, Zhong demonstrates how, in the televised representations, women’s desires and pursuits are depicted as almost solely defined—and then crippled—by a truncated and narrow vision of domestic happiness. Zhong also points out that the reluctance of women writers to explore female characters beyond the “womanly” and “unwomanly” binary since the 1990s indicates mounting ambiguities regarding women’s identity and their roles in a consumer-capitalist society. In her concluding chapter, Zhong looks at songs composed for television dramas. Considering musical lyrics an important element to supplement visual narratives, she identifies two popular motifs explored therein: the “nonlinear, circular, and ephemeral” model of history that informs the emperor dramas, and the sense of longing recurring in television lyrics across the board. Zhong observes that the former “point[s] the question of modern Chinese experience back to its own historicity” (p. 155), whereas the seemingly sentimental feeling of longing suggests loss and uncertainty, as well as hope, in a society uprooting from its past. 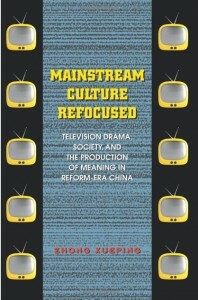 Mainstream Culture Refocused is a detailed examination of moods and trends in contemporary Chinese television culture. Zhong’s genre-based approach provides a useful model for studying such a complex and expansive subject. However, although she uses generic categories to organize her project, Zhong’s analysis does not employ many of the theoretical or methodological tools one might expect of a genre-based study. Questions such as how generic formulae affect artistic expression and public consciousness, or how genre-oriented mainstream TV functions as a potential site of social engagement rather than one of mere ideological coercion and/or escapism, are hardly asked or included in her discussion. Zhong’s ideological interpretations, while emphasizing the link between generic texts, social tensions, and dominant norms, nonetheless risk presenting PRC television culture as a one-way traffic of meaning production from TV programmers to audience. Although the author mentions on several occasions that many television texts are open-ended, her own analysis is marked by a surprising lack of audience studies, whether in the form of general surveys, small focus group studies, or critical reviews. By leaving out the receiving end of TV production, Zhong fails to account for the gap between TV’s institutional agenda and its public reception: the fact that differing social circumstances among viewers may lead them to arrive at a variety of interpretations of a televisual text. For example, a viewer might find the consumerist message in a family-marriage drama convincing, but disregard the family values depicted therein if they have little bearing on her own situation (or vice versa). As television genres continue to undergo phases of popularity in keeping with changing policies, technologies, tastes, and preferences, it is all the more important to investigate both the narrower meaning-making strictures of generic formulae and their broader features such as modification (by producers, writers, actors, etc.) and reception (by viewers, critics, and scholars), all of which help constitute the broader historical context of popular mainstream cultural production. In her introduction, Zhong lays out an important precondition for the growth of television studies–that the subject matter must be taken as worthy of academic engagement in its own right. This seemingly obvious point is important when considering a medium whose significance has traditionally been tied to its propagandist, commercial, or entertainment functions. Zhong’s vigorous defense of television as an essential field of academic investigation reminds one of early film critics’ efforts in defining cinema as a new form of art. Whereas most of those early writings inquired into the essence of cinema (what is film? How is it different from theater, photography, literature, or painting? ), similar questions of essence do not anchor Zhong’s inquiry into the television medium. For her, what distinguishes Chinese television representations is their “unabashed social concerns” (p. 11). Although the author refrains from declaring a “cause-effect correlation” between cultural texts and social reality (p. 11), in a book that seeks to establish mainstream television’s academic respectability not through its inherent artistic validity but rather through revelation of its socio-ideological agenda, it is difficult not to read Zhong’s upholding of the intrinsic worthiness of its subject matter as anything but a tactical pretense. After all, Zhong locates the substance of her work in her “insistence on recognizing the production of television drama as a sociocultural engagement–as cultural practice with complex ideological implications” (p. 11). Accordingly, her analysis shows a great dependence on speech and dialogue, rather than on unvoiced elements such as performance, mise-en-scene, or camerawork that are specific to audio-visual media. Zhong argues that “a heavy linguistic presence” is characteristic of Chinese TV drama (p. 23), and that the visual aspect “often tends to be passive and formulaic” (p. 24). This approach is partial to verbal passages that lend themselves to analysis as direct vocalizations of societal issues and problems. Zhong’s analysis of the final speech in Red Carnations (pp. 85-89) is a case in point. As part of the conclusive ending of an anti-corruption drama, the speech given by the head of the anti-corruption office suggests that a profit-based reward system is the key to combat corruption. Zhang aptly relates the speech’s public form to the transparency of free market ideology that informs the proposal, critiquing the deep-seated capitalist logic that not only normalizes monetary return as the ultimate form of reward but also endorses those who are already in power. This accepted primacy of dialogue is undoubtedly important to the book’s overall veracity, whose critical responses are often based on close reading of highly scripted texts, and Zhong’s approach duly prioritizes opinions and positions transmitted through verbal signs over (visual) aesthetics or issues of representation. The latter more non-verbal issues, however, to recall TV’s homology with cinema—a connection which Zhong repeatedly draws in the book—are of extreme significance to filmmaking and television production alike. This methodological preference for the analysis of language and scripted texts undermines Zhong’s effort to make television itself an object worthy of serious academic study. Although it is beyond this review to measure the political and scientific dimensions of different research methods, it is important to be aware of these choices and the ideological legitimacy each underscores. In practical terms, Zhong’s partiality towards word over image makes one wonder whether the author herself finds the visual forms and styles of mainstream TV dramas too tame or unremarkable to merit serious treatment. In a similar vein, while the author assigns “melodrama” conceptual importance in the Introduction, maintaining that it brings cross-genre commonality to Chinese TV dramas, the term is not sufficiently unpacked to be truly helpful. Rather, in several instances where “melodrama” is mentioned, it is used interchangeably with “melodramatic,” thus conveying a sense more disparaging than constructive. For example, Zhong’s discussion of Han Yan’s youth drama entails a comparison with filmmaker Jia Zhangke’s “antimelodramatic representations of young characters,” which makes the former “seem so stuffed with events and so filled with melodrama and (sometimes overly charged) emotions that they fail to leave the viewer enough time and space to reflect” (p. 107). It seems to me that the author’s perception of melodrama coincides with, rather than challenges, the negative connotations commonly associated with melodrama (in this case, emotional excess and anti-realism). Nor does Zhong take advantage of the vast body of scholarship on melodrama’s formal features (pathos, sensationalism, moral polarization, and so on), which has set valuable precedents for a reconsideration of the genre and its means of political engagement in a Chinese context. Zhong’s critical method—verbally focused, historically alert, seeing TV drama as a transmission of social reality, with an attempt to expose cultural positions and ideologies—owes much to traditional literary and dramatic criticism. This in part explains the comfort with which the author regularly shifts between literature and television, and sometimes cinema, without feeling compelled to note the differences between the media (a good example is the indiscriminate comparison between female characters in contemporary TV drama and those in women’s literature in the 1980s). This easy coalescence of media genres speaks for television’s disciplinary hybridity and, in particular, the definitive influence of literature on Chinese TV drama. As Zhong notes, not only have a large number of contemporary dramas been adapted from literary works, many writers themselves participated in the adaptation process. Moreover, it becomes evident in some cases that a prominent writer’s reputation aids in a drama’s popular success, while legitimizing paying scholarly attention to television. Where cinema is concerned, there is justification for a more textually-biased methodological approach; as Lent, Chen Mei, and others have noted, perceptions and criticism of film have until recently been inordinately influenced by language and text: “Film in China is understood and taught not as a fine art, but as a form of literature” (The Asian Film Industry, John A. Lent. Austin: UT Press, 1990: 16). However, as I’ve argued, this presumed interchangeability between literary and visual texts is essentially flawed when one assumes that it is equally operative in televisual texts, because it does not take into account the formal and institutional differences between written and audio-visual texts. Nor does it concern itself with the questions rooted in the very practice of adaptation: How do television adaptations address issues of fidelity and transformation? To what extent does literature concede to an intrinsic commercialism when fictional texts are adapted for the medium of television? Do censorship priorities (if television is indeed subject to stricter censorship than books) set uneven standards for different genres? How do directorial interpretations and styles come into play? The conflation of media forms also reveals a blurring of the contours of television study that invariably compromises the autonomy and specificities required of a discipline that, as the author herself passionately asserts, should be studied critically and independently. In the West, substantial research has been done to identify the ways in which television differs from comparable media forms such as cinema and radio, focusing on various aspects of television texts, including production history, generic categories and features (including visual elements), reception theory, and the social role of television in shaping the public sphere. Incorporating the fruits of extant television studies research when looking at PRC television culture would help locate the medium in a broader context and simultaneously uncover its multifaceted complexity beyond the narrow written-text orientation within which Zhong frames her study; furthermore, it would be wholly in keeping with her laudable effort to bring Chinese television studies into the center of Chinese cultural studies. These are reasonable complications, however, faced by nearly every Chinese television scholar today. The complexities of television production, consumption, representation, and regulation suggest that no single study can account for all possible contextual cues and combinations. Mainstream Culture Refocused is a valuable contribution to the growing literature on TV drama in Mainland China. Zhong Xueping presents to us television as a privileged site, where historical legacies continue to predict and shape the popular face of modernity. Her original analysis sheds light on the fascinating horizon of the television-scape, one that is constantly shifting as new political, economic, and social exigencies emerge. Furthermore, Mainstream Culture Refocused enriches the realm of television studies with great conviction, demanding intellectual participation and endorsement as the field seeks its rightful place in academia. Although some issues raised by the author still await further investigation, Zhong’s extensive research and well-supported arguments establish a solid foundation on which her own and others’ future research can build.